The smoothest ride. The best views. Exceptional service. As the sun casts a soft glow across the skies, set sail for a journey into the Hawaiian sunset. Enjoy the beautiful sunset while dining at sea! Come with us to see the other side of Waikiki and take in a more elegant view in rare style. Three luxuriously appointed decks of dining, drinks, and awe-inspiring views – all yours. Experience a memorable evening aboard the sleek and state-of-the-art vessel, the Majestic. With the addition of SEAKEEPER technology, Majestic offers the latest advancement in boat stability. Large, panoramic windows allow Oahu’s famous coastal views to take center stage. 8 oz. of crab (about 3-5 crab legs), steamed and seasoned to perfection. Served with garlic butter. *One free drink with adult dinner cruise purchase. Valid for all dinner cruises including Friday Nights and Specialty Cruises. Drink choices are: Mai Tai, Blue Hawaii, house wine or domestic beer. 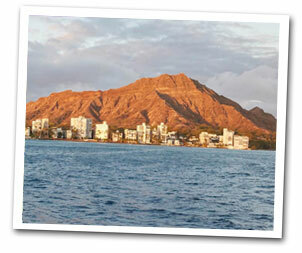 Includes complimentary round-trip transportation from select Waikiki hotels. Departs from Pier 6. Aloha Tower Marketplace self-parking is also available for a fee. Check-in 30 minutes prior to departure. The tour is 2 hours from 5:30 pm to 7:30 pm. *Includes one drink ticket for complimentary Mai Tai, Blue Hawaii, House wine, Domestic Beer.